For day two of quick and easy cabinet updates I am sharing something that will probably take longer to type up than it took to actually do the project. Have you ever noticed that lots of people love to build up their cabinets (as I did in the last project) but then they just leave it there? What about the bottom of the cabinets? If you look at custom cabinets, they almost always have trim at the bottom of the cabinet. 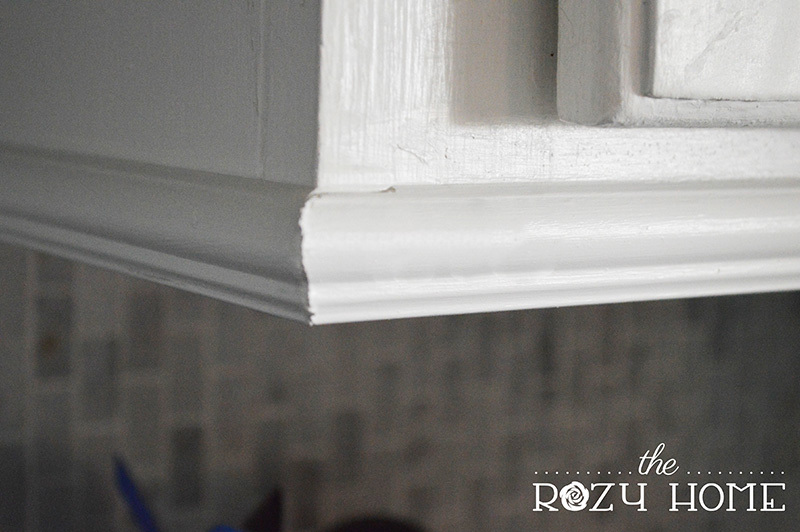 Luckily, adding trim to the bottom of the cabinets is not only quick and easy, but my total cost for this project was only $11! For this one all you need to do is cut and nail the cabinet trim to the bottom of the cabinets, prime, paint and that's it. Easiest update you will ever do. The cabinets after being built up. The bottom before. It looks so unfinished now. Prime, paint and that's it. It's really hard to see in the photo, but it really brought the cabinets together. I used the same trim from the build-up tutorial to ensure it was cohesive. This entire project (from cutting to painting) took right at 15 minutes. I had four cabinets total and only needed 2 - 8 foot pieces of trim. $11 and 15 minutes - my kind of project!